Origin Native to India, Southeast Asia and China. It was naturalized in Hawaii and Galapagos Islands. 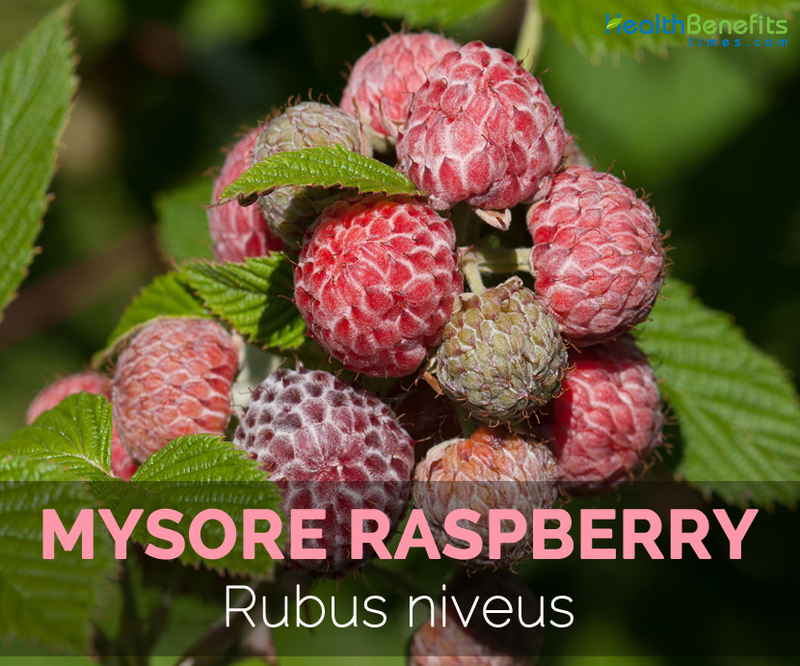 Mysore raspberry is an edible fruit which is produced by many species in the genus Rubus in the rose family Rosaceae. It is widely cultivated for its edible fruit. The fruit is widely appreciated for its mild sweet aroma and dark red to black color. It is eaten in large quantities either fresh or as pie, jam, tarts and jelly. 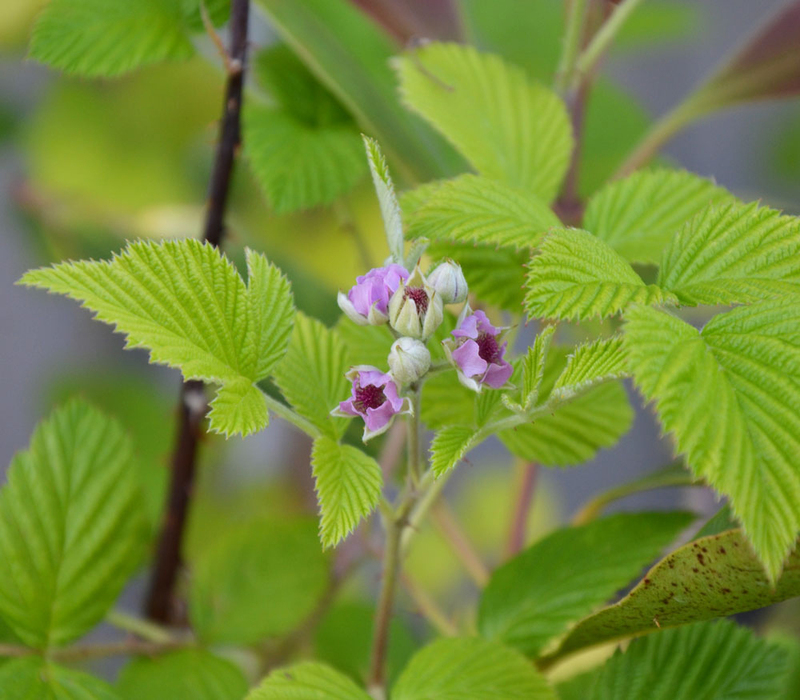 Around December, the plants starts start to grow pink to rose purple flowers that develop into small dark red to black berries. The stems are hairless. Mysore raspberry is also known from common names such as Ceylon raspberry, Hill raspberry, Snowpeaks, Huftoo, Kale hinure and Kali anchhi. Native to India, Southeast Asia and China, it was naturalized in Hawaii and Galapagos Islands. In 1965, it was introduced to Hawaii. The seedlings were sent to parts of East Africa, Kenya and South Africa from India. Then it spread to Florida. Mysore raspberry is also grown in Puerto Rico, Myanmar, Afghanistan, China, Thailand and Malaysia. 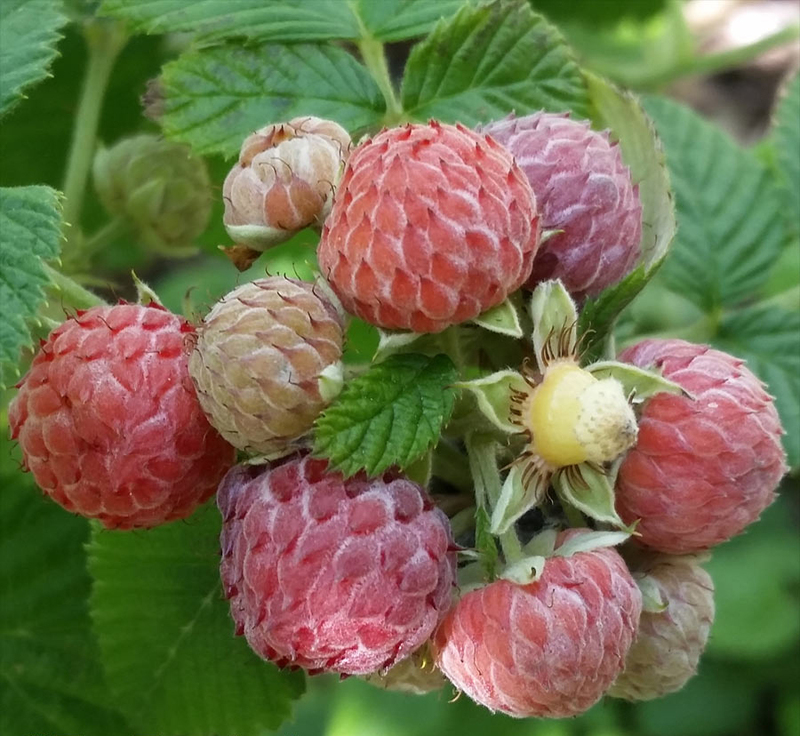 Mysore raspberries grow in roadsides and cleared fields but also found in Maui and Kula. It is grown in moist deciduous, evergreen forests and grasslands. 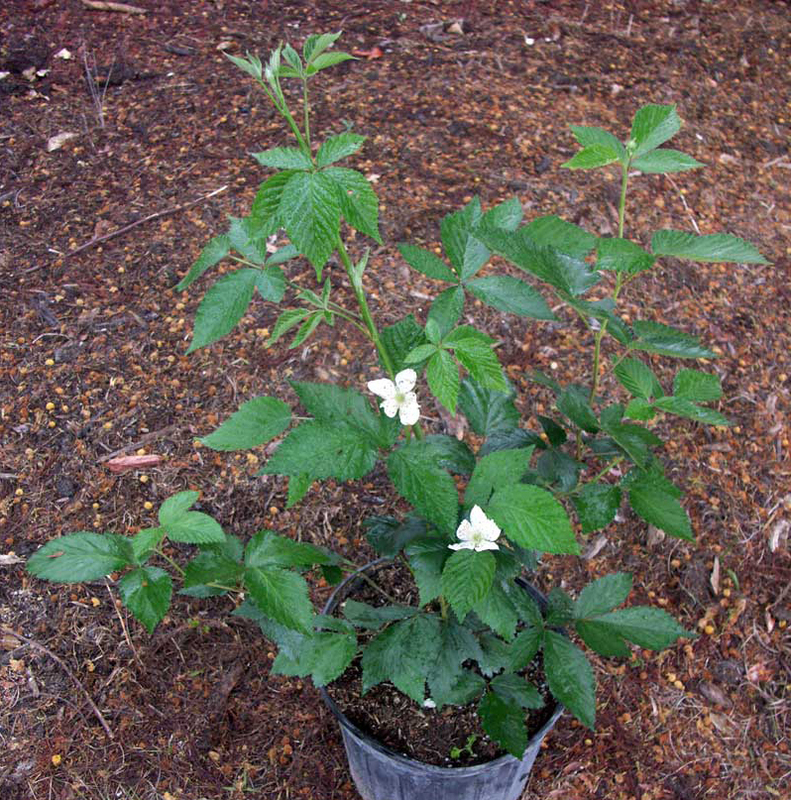 Mysore raspberry is a perennial stout shrub which grows in a tropical climate and 6 ½ ft. high. Leaves are pinnate, compound, elliptic to ovate to elliptic, 2.5-6 cm long and 2-3 cm wide. The stems are glabrous, glaucous, hairless, cylindrical and flexible. 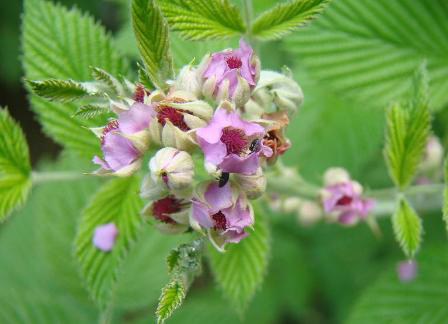 The shrub bears pink to rose purple flowers of obovate-suborbicular shape of 4-5 mm long. The flowers turn to subglobose fruit which has 1-2 cm as a diameter. The plant has sharp and hooked thorns which is 3-7 mm long. The seeds were introduced in 1930s from India to Kenya where Mysore raspberry was cultivated for years in the mountains. Then the seeds got posted to F.B. Harrington of Natal (South Africa) in 1947 before it was sent to University of Florida’s Agricultural Research and Education Centre (USA) in 1948. The seeds were planted throughout Central and South Florida. In a few years, the plantation of Mysore raspberry got discarded because of the dense thorny thickets formation which made the harvesting of fruits troublesome. From Florida, the seeds got posted to University of Puerto Rico in 1955. Before arriving to Galapagos archipelago they travelled to Honduras from Florida. It spread to Isabela, Floreana and Santiago. R.niveus was expected to introduce from Florida (USA) to Costa Rica and Hawaii (USA). R.niveus was illustrated as an emerging threat in USA, Central America, South Africa and Australia. It has got introduced in the world and is found in Mozambique, Zimbabwe, Swaziland, Zambia, Kenya, South Africa, New South Wales, Queensland, Guatemala, Nicaragua, Costa Rica, Panama, Honduras, Dominican Republic, Puerto Rico, Haiti, Cuba, Brazil, Ecuador and Bolivia. Mysore raspberry is rich in manganese. One cup of berries provides about 60% of the daily recommended allowance. Manganese assists in the absorption of calcium and also prevents osteoporosis. It is also a great source of dietary fiber. 100 g of Mysore raspberry contains 28 calories with 0.6 g of fat, 1.3 g of protein, 3.7 g of dietary fiber and 4.4 g of carbohydrate. The same amount offers 27 mg of Vitamin C, 1.4 mg of Vitamin E, 0.1 g of Vitamin B6, 0.05 mg of Vitamin B2, 0.5 mg of Niacin and 0.03 g of Vitamin B1. Mysore raspberries are loaded with various antioxidants and health benefits. 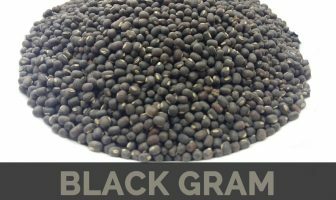 It is rich in polyphenols as well as anthocyanins. Raspberries possess astringent, refrigerant and hemostatic properties. The fruit of Mysore raspberries helps to treat gout, constipation, obesity, gout and also comforts childbirth. Mysore raspberries are used in Tibetan medicine to treat wind fever. It also helps to lower the chances of cancer and heart disease. Vitamin C lowers the chances of stroke which is a kind of cardiovascular ailments. The foods rich in Vitamin C help to maintain the level of blood pressure. It prevents the body against free radicals which is the major cause for the stroke. The study shows that the people with high intake of Vitamin C, their chances of getting stroke was reduced by 42% in comparison to those with the low intake. The veggies and fruits have high content of Vitamin C so one should intake more veggies and fruits in a day. The evidence supports that the diet rich in fiber helps to prevent obesity. The intake of fiber has inverse relationship with the body fat and weight. Fiber makes feel fuller and prevents overeating and snacking in the next meal. The result shows that the diet rich in fiber reduce the intake of food and results in low weight. Fiber also reduces the toxin absorption and modifies the gut hormones secretion. The soluble fiber slows down the digestion and also stabilizes the level of blood sugar. It enhances the insulin sensitivity and controls the spike of blood sugar and diabetes. The study shows that the dietary fiber and blood glucose has negative relationship so the high intake of fiber prevents the insulin resistance which forms due to increasing level of glucose at a time. The diet rich in fiber prevents the digestive ailments such as colon cancer, diverticulitis and inflammatory bowel disease. Prebiotic fiber helps to promote the immune function and also maintains the health of colon and intestines by clearing the toxics from the digestive tract. The diet rich in fiber also reduces the chances of heart disease and cancer. The prebiotic fiber protects the gut as well and raises the immunity by modifying the way that the body behaves to bacteria and acids. Cholesterol is a substance that occurs naturally which is made by liver. It is essential for the functioning of nerves, cells and hormones. The oxidize level of cholesterol is harmful for the body. Cholesterol is in natural state when they are normal, healthy and balanced. The studies show that Vitamin E counteracts with the oxidation of cholesterol. It eradicates damage caused by free radicals which are the cause for the cause for oxidation of cholesterol. Vitamin E strengthens the walls of capillary in the skin and promotes the elasticity and moisture. It acts as the anti-aging nutrient in the body. The studies show that Vitamin E reduces inflammation on the skin and body. The antioxidant properties help to prevent the skin cancer when exposed to UV rays of sunlight or cigarette smoke. The intake of Vitamin E along with Vitamin C encounters the skin inflammation when exposed to UV rays and also lowers the signs of eczema and acne. Vitamin E speeds up the healing process of the skin. It speeds up the regeneration of cells and treats wrinkles, acne and scars which helps to make the skin look younger and healthier. Vitamin E acts as an antioxidant which reduces the environmental damage of hair. It improves the circulation on the scalp. The oil of Vitamin E helps to retail the moisture of the skin and prevents the dry, flakey scalp. Hair will look fresher and healthier with an application of this oil. Few drops of oil could be applied to the hair if it looks dull and dry. Vitamin E reduces the chances of macular degeneration which is the major cause for blindness. Vitamin E assists the vision health. It should be consumed with Vitamin C, zinc and beta carotene. The high intake of Vitamin A and Vitamin E promote healing as well as vision in the people who are undergoing the laser eye surgery. The fruits are consumed fresh or served with sugar, cream and ice cream. They are also used to make pie, jam, tarts and jelly. Fresh fruits are also frozen for the future use. Fruits are also used in desserts. Berries are damaged and culled berries are placed on freezer bags and frozen for the culinary purpose. It is also used to make glazes or sauces. The juice extracted from fruit is used as antidote for the snake bites. It is also used as a tonic in enthonoveterinary medicine during pregnancy. The tips of the roots are used in India to make small pills which is used to treat extreme bleeding during menstrual cycle and to cure diarrhea and dysentery. The study shows that the extracts of roots acetone possess antipyretic, analgesic and anti-inflammatory properties. 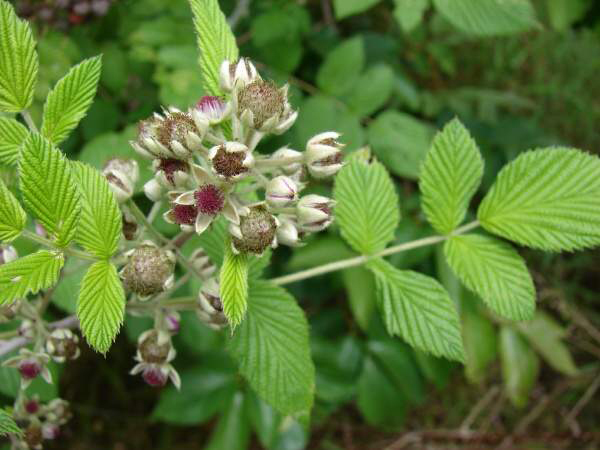 It has antioxidant properties and has the ability to treat wounds, skin diseases and tumors. Dyctisperma lasiocarpus (Sm.) Raf. ex B.D.Jacks. 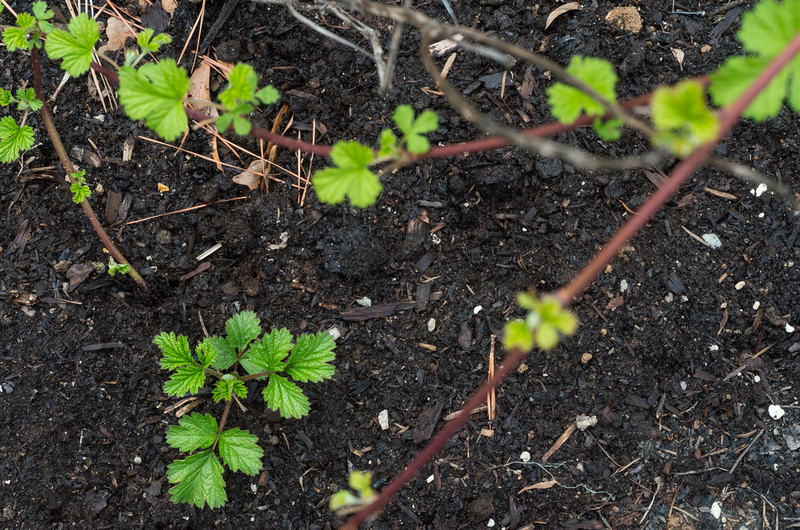 Rubus lasiocarpus var. micranthus (D.Don) Hook.f. Calories 28 Kcal. Calories from Fat 5.4 Kcal.